"Ginny" finished her championship in January 2014. 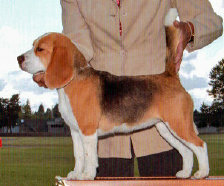 She is a 13" red & white Beagle. "Meryl" finished her championship in 2016 with 4 majors! She is the daughter of CH. Ha-Penny's Too Much Trouble and our CH. TwainHeart LongLake Geneva Treasure. She is a 13" Beagle.